Now that your fence posts are ready, it’s time to add the chain link fencing. 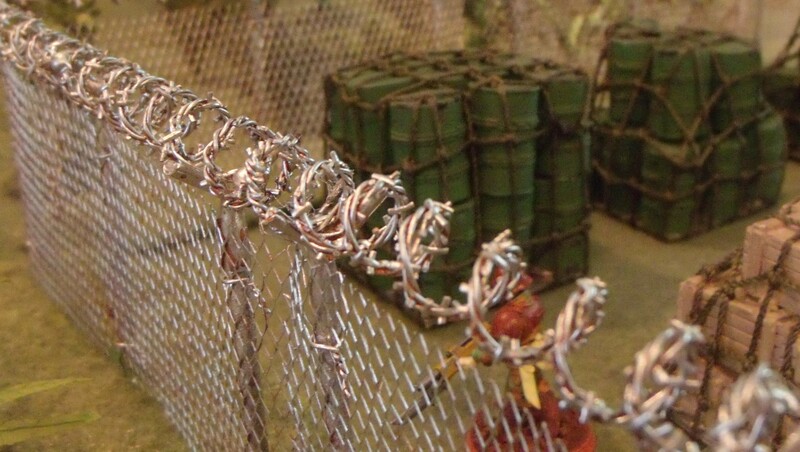 The best material to use for this is craft wire mesh. It can usually be found in craft stores. If you can’t find any, mosquito netting can also work. Since mosquito netting is very soft, it is usually necessary to soak it in a mixture of PVA glue and water to stiffen it up. Now cut your fencing material to the right height and width. Using a template to ensure that all of your chain link sections are the same size is a good idea. The best way to attach it to the posts is with some small twist ties. Start by bending the wire into a U shape and insert it through the mesh. Cross the wires by hand then twist them using a pair of pliers. The tails were then cut short and bent down out of the way. Next we hot glued a stiffener into the straws to give them the proper 90deg angle, cut the brackets to length, and added the role of concertina wire to the top of the fence. Once the assembly was done we spray painted the whole thing silver and gave it a brown wash to make it look a little rusted. After that, simply flock it and you’re ready to play.